Hello my lovelies! Today is extremely busy for me and the fact that I didn't prepare this post in advance is not helping at all. So this post is gonna be short and on point. The manicure I'm showing you today is not something I'm particularly in love with. I do like how it looks on my hands but the pictures don't do it justice at all. I really wanted to use a polish that my good friend Kinga gave me to try out. It seemed great for stamping but in fact it was too thin for that, so I had to use it as a base instead. This is the result. 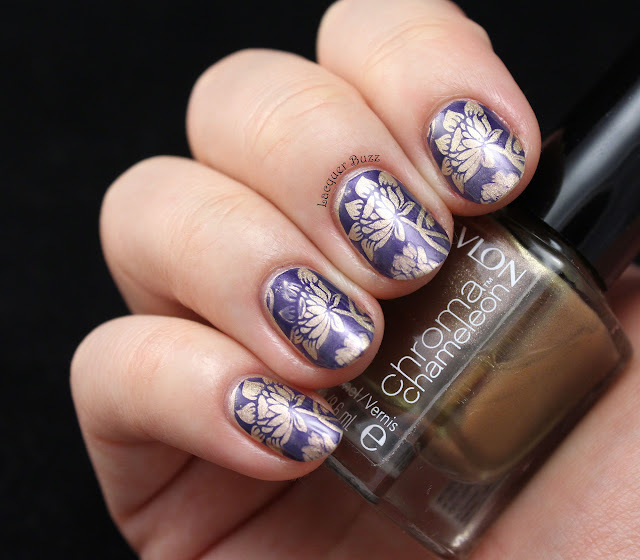 The polish I'm talking about is Revlon Pink Quartz from the Chroma Chameleon line. 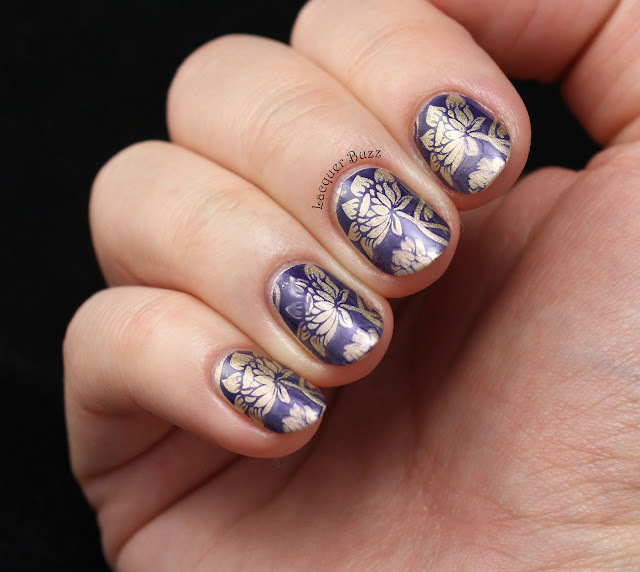 It's a beautiful golden foil with a pink duochrome effect. It looks lovely in the bottle but it's too thin so it's impossible to stamp with. It also needs at least 3 coats to look completely opaque on the nail. 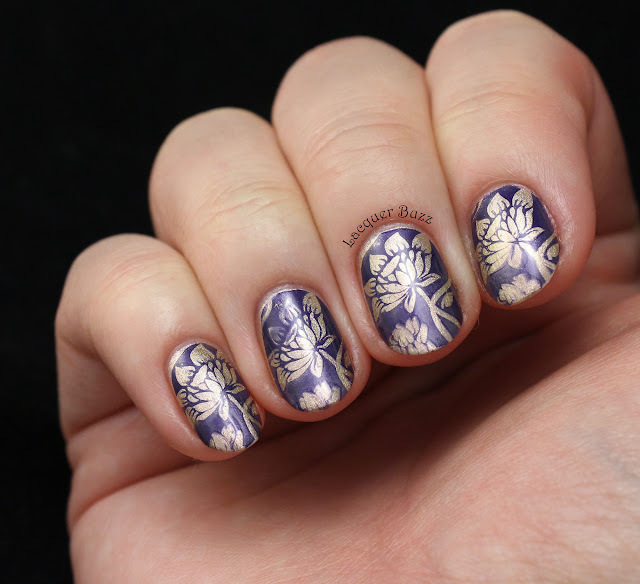 I did two only because I was gonna cover it with stamping. 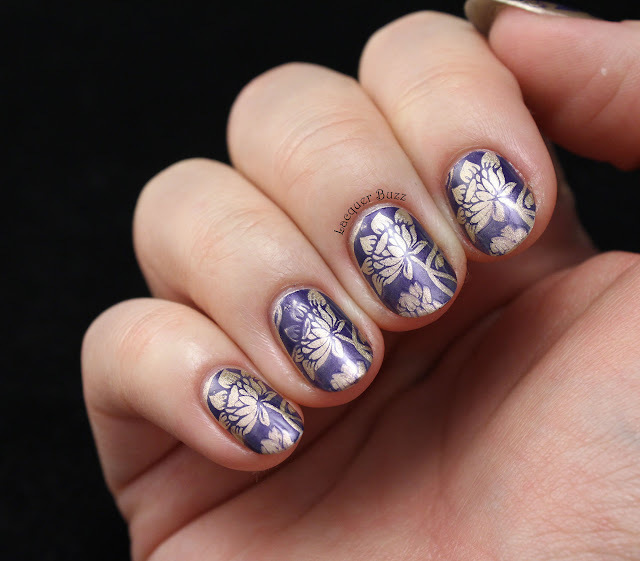 I chose a flower image from plate BP-L024 from the Born Pretty Store and used Essie No More Film to stamp it. I really wanted an opaque blue polish to stamp with so I chose this blurple one because it's a one coater. It didn't work that great either and it looks a bit see through on the nail. The stamping isn't perfect at all but what can you do? I can assure you that this looks so much better in real life. For some reason the pink duochrome didn't come out in pictures at all. I'm glad I got to try this polish but I'm not that crazy about it in the end. Please let me know what you think! Don't forget that you can check out the rest of the Monday Blues in the links below!